It was the week after last year’s Fourth of July when a diabetic patient rushed into the Northside Pharmacy to get five pre-filled insulin pens; five, because that was all that the insurance company had authorized. The patient had a 3-month shipment of Novolog dropped at his door just after he had left home for a three-day weekend. When he came back, he saw the gel-coolant had melted and concluded that the drugs were ruined, so he dumped the insulin, all $1,300 of it. Insulin loses its effectiveness at extreme temperatures, and the FDA recommends that insulin stored above 86 degrees Fahrenheit be used only in emergency circumstances. “He said, I’m not going to inject that into my body, it’s been three days, it’s 100 degrees!” said Halina Jankowski, co-owner of Northside Pharmacy in Williamsburg, Brooklyn. Her pharmacy can’t fill the patient’s regular insulin prescription because the insurance company forbids it. “I have my own pharmacy, but I’m forced to do mail order for the drugs I use personally because of my insurance,” Jankowski said. According to retail pharmacists, stories like these are all too common. Although a majority of patients prefer to get their drugs from traditional pharmacies, insurance companies are increasingly requiring customers to buy their prescriptions from large mail-order companies. The drugs most commonly affected are among the most expensive drugs, and the most lucrative for sellers. 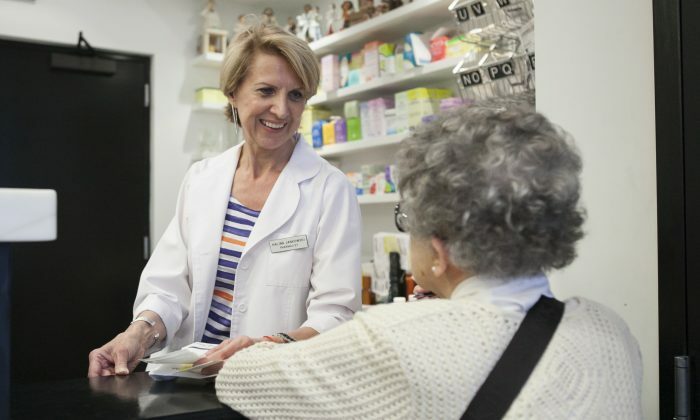 Last week, the New York Assembly passed a measure to expand patient access to filling prescriptions from brick-and-mortar pharmacies by adjusting the standards that insurance companies can impose on retail pharmacies. The measure attempts to close loopholes in a 2011 law passed by the state that protected consumer choice. The revised bill, which mainly affects access to specialty medication, passed the state Assembly last week, but remains under review by the Senate. If the bill becomes law, New Yorkers would still have the choice to access mail-order plans. Pharmacy Benefit Managers (PBMs) that manage prescription drug benefits for more than 200 million Americans oppose the measure. PBMs operate mail-order pharmacies, and compete with retail pharmacies in filling prescriptions for patients. The Pharmaceutical Care Management Association (PCMA) claims that the measure would increase prescription drug costs in New York by $6 billion in the next decade, citing a report by Visante, a health care consulting firm, commissioned by the PCMA. The PCMA, which represents the nation’s largest PBMs, also opposes the measure on safety grounds, arguing that traditional pharmacies don’t have the means to adequately handle specialty medication for diseases such as cancer, multiple sclerosis, and Huntington’s disease. Total U.S. outpatient spending on prescription medication is projected to be $295 billion in 2015. Specialty medications represent $67.5 billion of that. The PCMA recently launched an ad campaign in New York against the measure, saying that very few doctors believe that all traditional pharmacies have the capability of administering specialty medication. The ad referred to an online survey by North Star Opinion Research of 500 physicians who prescribe specialty drugs. The report said that only 5 percent of the physicians believed that all traditional pharmacies have the expertise and capability to provide specialty drugs. The survey also indicated that 25 percent of physicians think that most traditional pharmacies are capable of providing specialty drugs, 66 percent believe that some are capable, and only 2 percent believe that none are capable. “Ensuring patient safety for those taking complex medicines for conditions like cancer, multiple sclerosis, and other illnesses should be a top priority,” said PCMA CEO and President Mark Merritt. The current measure would remove the “terms and conditions” clause of New York’s anti-mandatory, mail-order pharmacy that passed in 2011. Retail pharmacies said that insurance companies use the terms and conditions language of the law to unfairly prevent brick-and-mortar stores from filling prescriptions, violating the spirit of the 2011 law. The 2011 law requires retail pharmacies to accept the same reimbursement rate and “applicable terms and conditions” as mail-order pharmacies. “The PBMs and Plans are only using this terms and conditions language with the specialty drugs because this is where there are high profit margins, but the law covers all prescriptions,” said Heidi Siegfrid, health policy director at the Center for Independence of the Disabled. Siegfried said that a common definition of specialty medication is when a one-month supply of the drug costs more than $250. Local pharmacies in New York said that insurance companies are using the loophole in the law to prevent them from providing not just specialty medication, but general prescriptions as well. John Cannizzaro runs the Hudson Square Pharmacy in Lower Manhattan. He said that the 2011 law hasn’t prevented insurance companies from using the “smokescreen” of unfair requirements to stop him from filling out prescriptions, such as preventing him from dispensing more than a one-month supply of many drugs, or making him charge a higher co-pay than mail-order companies. “The insurance companies seem to—there’s no restricting them—they do whatever they want, then they get a slap on the wrist,” he said. Pharmacists said that insurance companies impose obscure standards that are impossible for retail pharmacies to fulfill as a means of excluding them from the market. Pharmacy owners said that in addition to being wasteful, the current arrangement forces community pharmacies to subsidize the PBMs who run the mail-order services. Jankowski said that some of her patients have their doctors write out two prescriptions and often pay out of pocket for one- or two-week supplies of their drugs from her pharmacy in anticipation of mail-order problems. Jankowski recalls how once she was called by a PBM requesting she store a drug for a client of theirs who also frequented the Northside Pharmacy for other drugs. The drug wasn’t directly mailed because it was temperature sensitive. Her pharmacy would receive nothing for this storage service. “So I’m supposed to provide the refrigerator, the convenience, why don’t you let me dispense the prescription?” Jankowski said. “The retail pharmacies are always bailing people out, constantly, and it gets unappreciated and unnoticed,” said Russell Gellis. The ascendance of PBMs hasn’t been without consequence for retail pharmacies. In January of this year, the Avignone Pharmacy in the West Village closed down and sold its site to CVS Pharmacy, whose parent company CVS Caremark owns one of the largest PBM companies in the country. Still, small independent pharmacies are holding out, at least for now. A report by the NCPA said that in the last five years the percentage of pharmacies in New York that are independently owned remain steady at 57.7 percent. The current science of the costs and benefits of mandatory mail-order drug policies is hotly contested. The PMCA points to an array of studies, including studies by federal agencies that conclude that mail-order pharmacies save consumers billions each year. “Employers wouldn’t use mail-order if it didn’t save their employees money,” said Charles Coté, a PMCA vice president. Employer-based health plans represent a majority of the health care market. Coté said that the new measure would “help drugstore owners and hurt everyone else” and drug costs would rise without the “volume based price concessions” that PBMs can obtain from wholesalers. However, the process of determining how much greater efficiency PBMs contribute is opaque. “Drug pricing is an almost impenetrable bog,” wrote Katherine Eban for Fortune Magazine in 2013, in an investigative report on how New Jersey hospitals saw their drug costs soar after they hired Express Scripts, the largest PBM in the country, to manage their drug benefits after discounts were promised. Douglas Hoey, CEO of the National Community Pharmacists Association (NCPA), questions the credibility of the majority of the studies on drug costs. Hoey said that it’s not the consensus that PBMs are cost-efficient, citing a 2012 study from Virginia Commonwealth University, which concluded that for 90-day subscriptions, the retailer was actually cheaper than mail order. Kevin Schweers, also from the NPCA, added that supposed cost-benefits are irrelevant in New York, because under the 2011 statute retail pharmacies have to match mail-order prices. “Employers should be making the calls,” he said.